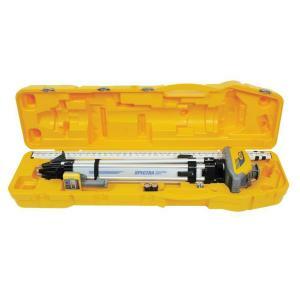 The Spectra Precision LL100-2 Laser Level System is a complete one man leveling crew in a case. Just open the case and go to work. All components are contained in a single hard-shelled, portable carrying case for easy transport, storage and use. The package contains the LL100 laser transmitter, HR320 receiver with clamp, tripod, and a 15 ft. grade rod with an 8ths scale. Automatic self-leveling ensures accuracy across the jobsite. With the easy, one-button operation you can instantly go to work on any job. The LL100 laser is capable of handling a wide variety of elevation control applications on residential and smaller commercial jobsites including leveling pads, forms and footers, estimating cuts and fills and general elevation control. The system is ideal for decks, terraces, landscaping, pools and septic systems. Versatility is added with single-axis manual slope capability for use in driveways, ramps, and residential drainage lines. It is designed to be jobsite tough, can survive a 3 ft. drop onto concrete and is water resistant. Tbook.com crawls the web to find the best prices and availability on Levels and related Tools and Hardware products like Spectra Precision Laser Level System Complete with Self-Leveling Laser Receiver with Clamp Tripod Grade Rod.... For this page, related items include products we find that match the following keywords: "Level" at our vendor partner Home Depot. Spectra Precision Laser Level System Complete with Self-Leveling Laser Receiver with Clamp Tripod Grade Rod... is one of 154 Levels and related products listed in the Tools and Hardware section of Tbook.com If you have any questions on this product, please give us a call at 734-971-1210 during the hours of 9am - 5pm EST for assistance. Thank you for shopping at Tbook.com, the Internet Department Store!